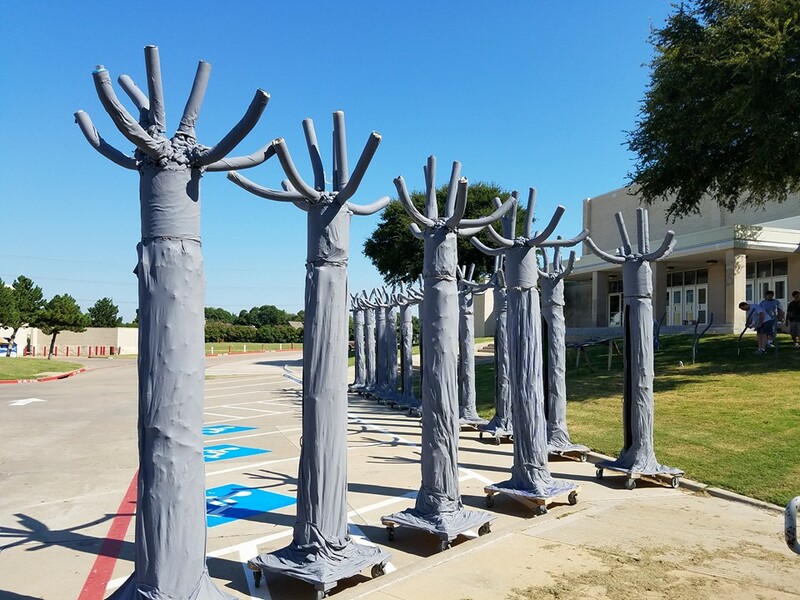 The Pit Pops took advantage of the break between football games and completed the tree props for the band’s contest show The Dark Forest. Next time you see a member of the Pit Pops be sure to say “Thank You!” for their amazing prop work! As the students work to learn the final parts of the show, band parents are busy at work on multiple projects and activities. With updates occurring daily, please be sure to check your Charms email and our Facebook group for information. Our awesome Mum Moms, Charlotte Williams, Kim Gordon, and Cindy Jenkins are hosting a Mum’s training session. Feel free to stop by and help out. After training is complete and we’re taking student orders, the band will need parent volunteers to work at the Mum store and build mums to order. Charlotte will be posting information soon on how and when parents can sign up to volunteer. Mums is one of the band’s biggest fundraisers. Any help you or a family member can provide benefits the LHABC community. To help support the band, please plan to stop by for breakfast, lunch or an early dinner with the family. LHABC will receive 10% of the profit earned on Thursday. 2016-2017 Band Posters Are Almost Here! Our wonderful band poster sponsors this year are Nathan Grace Real Estate Group and Total HVAC. We appreciate their support! A special thank you, to the following individuals, who helped make the poster possible: Brent Erschen, Ros and Steve Wilhelm, Julie Atkins, and Charlotte Williams. Key Note: We’re sitting on the visitor side of the stadium. As of today, the band will be in full uniform this week. Leigh Tidwell will need additional chaperones at half-time to help with the uniform plumes. 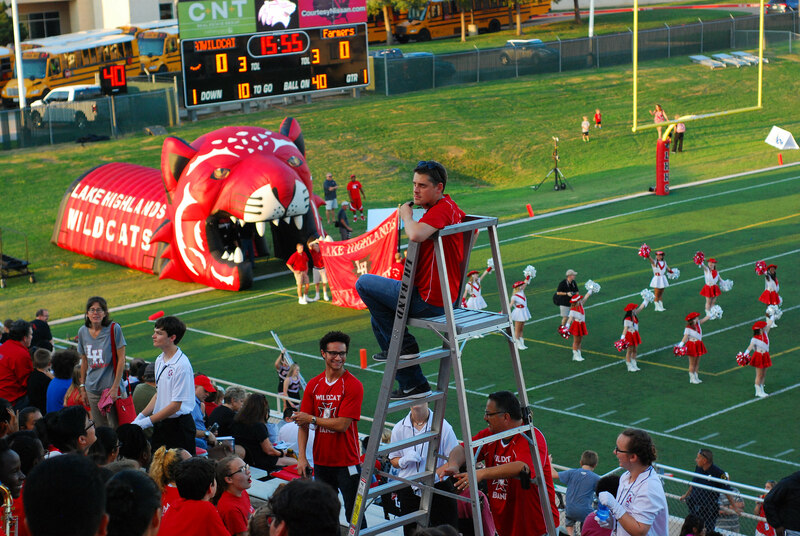 As always, the band needs parent volunteers to help make the game a success for the students from meal prep and serving to chaperoning the game. If you are interested in helping, please contact the appropriate Chair below to receive a Signup Genius notice. Key Note: The LHABC Chairs provide game volunteers passes for free access to the game. LHHS Band Fundraiser at Dugg Burger in Case Linda – watch for a post on Facebook. Wind Ensemble, Color Guard, and Battery will perform at the opening of the First Choice E.R. on Northwest Highway from 9:30 – 10:30 am. Midlothian Marching Contest, our performance time is 3:15 pm. We’ll need chaperones to travel with the band, details to follow on departure and return times. We’re busy securing business and student ads for the Varsity Revue program. Melanie Gilmore created a list of businesses to contact, to sign up for a business go to Signup Genius. We still need help contacting businesses about advertising in the program. Parents are welcomed to purchase ads celebrating their student’s band participation or to acknowledge a senior band student. Please take the time to review the list and select a business or two to contact. Click to download – business letter and ad form. Thanks for supporting the band! The Call to Audition for student performers for Varsity Revue started today! All students and groups are welcome, so pick up an application form on the bulletin board by the band hall. Forms are due back by Wed., Sept. 28. For immediate real time updates – please check Facebook. We are working to provide real-time updates via Twitter.